It is hard to believe that it is March already: Mardi Gras is this Tuesday, which means that Easter is forty+ days away. Spring break starts in six days (but who’s counting) and graduation is in a little more than two months. Yes, spring is a time of great anticipation in more ways than one: longer days with the advent of daylight savings time; warmer weather which means a more colorful landscape with green grass and pretty flowers; and hectic schedules to accommodate the end of another academic year. If I thought the first two months of 2011 passed quickly away, I can’t imagine how quickly these next few months be. Without going into much detail – because quite frankly I think I have written about this subject far too much on this blog – Mom has taken a turn for the worse. Last weekend was a terrific weekend, as she saw my son and her half sister. On Monday my youngest and I had a very pleasant conversation with her. She looked good, sounded good, and acted in good spirits. By Wednesday hospice called to say that she was declining; by Friday they put her on daily visitations (translation: she is in the active stage of dying). I have spent the majority of the past three days trying to gather all my paperwork in order so that if I need a substitute this week before spring break, then he/she can easily slip into the role. This is all such a surreal experience. I am normally not much of a movie goer. I’m not sure why – although I think it started when the cost of going to the movies rivaled the price of a nice dinner at a fine restaurant. But somehow that evolved into not watching movies ever – not on DVD nor television. So I found it rather surprising that I had a desire to see not one but two movies over this past week: The King’s Speech and Black Swan. I had seen The King’s Speech in the spring when my daughter invited me to attend a preview. I thoroughly enjoyed the movie at that time and I was anxious to see how much had been edited for the final release. Not only is the story an encouraging one of overcoming life’s obstacles, but the on-screen chemistry between Colin Firth and Geoffrey Rush is delightful. I had mixed feelings about seeing Black Swan. I desperately wanted to see the ballet scenes (of which there are many and all captivating to watch) and I wanted to see Natalie Portman’s award winning performance (which I totally understand the academy’s vote: she is in nearly every scene of the movie and gives a gripping performance of someone who has become ensnared by the tentacles of perfectionism her entire life). There are a few rated R scenes that I would prefer left on the cutting room floor, and the bloody scenes were a bit too realistic for my queasy stomach — but other than that, I found myself reflecting on the movie and its message long after I left the theater. I have so thoroughly enjoyed these movie experiences that I ordered two other award nominated films through Netflix, The Social Network and Inception, and I hope to watch them in the comfort on my own home next weekend. Last week Belle posted a link on facebook which provides the PDF files of the top ten nominated movies. I immediately checked out the site and began to brainstorm ways in which to use this as part of a lesson plan. As I have mentioned in the past, my English Comp class is quite interested in making some short films at the end of the year. They completed the final drafts of their narrative stories two weeks ago, and this week they will begin to translate that narrative into script form. Now, I know absolutely nothing about writing film scripts and I was planning to do some extensive online research to help with this deficit. However….with this amazing site I have decided to let the students teach themselves. I strongly believe that we can learn about writing well by reading good writing (does that make sense?) By having the students read the best of the best – they are bound to learn something about this craft. I figure that this is perhaps a real application of the old proverb: give a man a fish, feed him for a day; teach a man to fish, feed him for a lifetime. I reason that if students can learn to teach themselves (of which I am quite certain they are capable) then they can truly accomplish any goal that they set for themselves. Of course, I may be working myself out of a job, but if I can teach students this lifetime skill, then I am willing to take that risk. I am going to begin literary circles in my English 1 class after Spring break. One focus of this year’s experiment is to ask students to discuss the literary merit of each of the books that they choose to read. As an introduction to this unit study I asked students to research literary merit for homework and come to school prepared to develop a class definition. Some students chose to jot down their own thoughts (not exactly what I had requested, but at least they spent a few minutes thinking about it), some chose to look up the words “literary” and “merit” in the dictionary and then develop their own compound word definition; and some actually chose to google search the term. Imagine my surprise – and the surprise of my students – when that search led them to my blog! In fact, I believe that my humble blog was about the fourth suggested website for that topic. When I asked the students if they actually read the entry, one student replied, ‘Yea – it was about a bookstore” Well, this is true – but had the student read further she would have discovered that I actually outlined six points that I believe are a part of this broad concept. So this was a lesson for me as well as the students. Students learned that sometimes you have to read more than the first paragraph to discover the desired information; and I learned that perhaps there are more than just a few casual friends who read what I write. That is quite a sobering thought! So perhaps I owe it to myself – and the google crowd – to update my post on literary merit to include a more in-depth discussion of that particular term. In an effort to perhaps be a bit more inclusive, I would like to ask you today: How would YOU define literary merit? As you can probably guess, reading has once again taken a backseat. I have but one more chapter and I will have completed Joan Anderson’s The Second Journey. I do hope to write a short review of that book on my blog when I finish. It has been a good book for me to read during this difficult time dealing with Mom. I have also read the first six chapters of Jane Eyre. While I do not think I will finish this classic prior to the March 11th movie premier, I am hopeful to finish it during spring break so that I can take advantage of those days off to see a matinee performance. I am most excited for the Spring 2011 Read-a-thon, and I am hopeful that the timing of this semi-annual event, the weekend of April 9, will correspond with a much anticipated rekindling of my reading passion. I know that I have plenty of material in house to participate — it is just a matter of academic scheduling as well as personal interest. Are any of you planning to participate in this fun, literary event? While I would not be truthful if I said I was looking forward to this week, I am certain that by God’s grace I will find the joy in the difficulties. I hope that you have a good week, however, and that the promise of Spring’s rebirth is evident in your neck of the woods. I'm very sorry to hear about your mother Molly and I don't think you have written too much about it. My prayers will be with you and your family. This is a passage we must all face with our parents but not one that is easy to go through at any time. So sorry to hear about your mum. It's an awful thing to deal with. Hope that the rest of your week goes ok! Oh, so much here, Molly, but the most important issue is your mom. My heart goes out to you and your family during this most difficult time. So hard to watch a loved one slip away like this. But make sure you allow yourself to fall back on your faith and your family to get through it. As far as the movies, you will enjoy The Social Network, and Inception is brilliant, albeit very confusing. My best advice is just not to try too hard to figure it out…just turn off your brain and take it in. I'm sorry about your mom. I know this much be painful and taking its toll. The one blessing in all of this is that you know you have been there for her and been able to say goodbye. It is the one thing I really regret about the way my mom died. And wasn't Black Swan freaky? I didn't know it was going to be quite that intense. I had to hide my eyes for quite a few scenes … like the blood on her hands and all that. 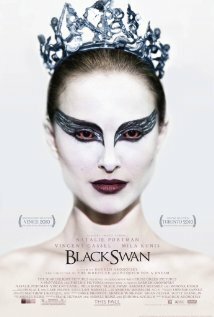 I loved when she became the Black Swan though. You could really see her change. I agree…the most important thing is your mom right now. This is your blog and if you don't write about the things that are happening to you, then it just becomes some mundane ramble…which it's not by any stretch of the imagination. Keep writing and know that my thoughts and prayers are with you, Molly. I'm so sorry to hear about your mother. I know how difficult this time is for you and your family. You're in my thoughts and prayers. Molly, there is no way that you have written too much about your mom. This is such a difficult time for you and writing about it can be a temporary relief. I wish I had had a blog when my mom died four years ago. It was quite traumatic. I followed your link to the Read-a-Thon but didn't find the website very informative. Have you participated in it before? I'm so sorry to hear the news about your mom (and as the others have said, don't apologize for writing about what is going on). I hope that her journey is a peaceful one, and I will be keeping you in my thoughts. On another note, I'm not much of a movie watcher either. I don't know why, exactly, but I think your theory of not wanting to pay the exorbitant prices and that morphing into not watching on DVDs has something to do with it. Oh Molly–my heart goes out to you. Like everyone else, I must say that you in no way have written too much about to your mom. What a very emotional time for you–she is your mama, and this will be a big loss. You have been there for her, and I am sure she is thankful for you–and you will be thankful to know you did all you could. As hard as it is to see her slip away, am glad you have had time to say good-bye. I will be praying for you this week–please let us know how you are, if you get a chance. I have signed up for the read-a-thon and am so excited. It has prompted me to start digging through my stacks of book, which need to be organized in a very bad way. I am trying to re-organized the shelves, and pull challenge books off the shelves and into a crate so I can find then easier. Molly- Please know that you're always in my thoughts and prayers!! Can I send my son to your school and have you specifically as his teacher??? He would love your classes!!! I'm participating in the RAT…wouldn't miss it!! Your family will be in my thoughts and prayers during this difficult time. May you find joy in the difficulties. I have to miss the RAT again as I will be on vacation. You, your mom, your family are in my prayers, Molly, and I also pray for your strength. Your question on literary merit really had me thinking earlier. To me, literary merit is more than being a best seller. A book such as Roots (Alex Haley) has literary merit as it set in motion a national interest in family origins and pride. The Little House books chronicled westward expansion for children. Mark Twain for defining what an American novel was, breaking away from English Literature. Oh, what fun it would be to be in your class. I want to see The King's Speech, but I haven't decided about Black Swan yet. I loved Inception but couldn't stand The Social Network – it didn't have a lot to hold my attention and I detested pretty much all of the characters in the film. Molly, you are very much in my thoughts and prayers. I hope this week has been going well for you. My husband walked into the room while I was reading your post, and I had to tell him the story of your students finding your blog when they were searching for "literary merit" – so funny!